A screen grab from a video purportedly showing a Chechen militant in Syria exhorting his compatriots to join Islamic State. 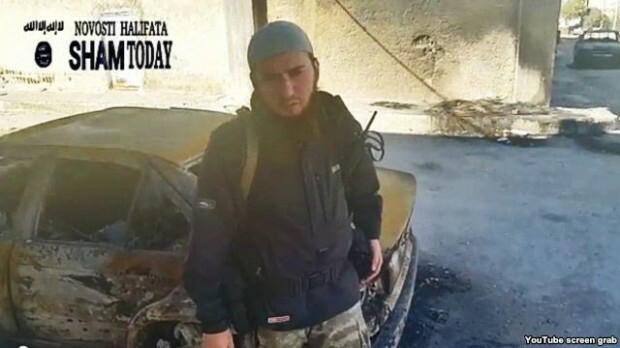 Chechen Islamic State (IS) militants in the Syrian town of Kobani have urged Chechens in Europe to either join in the fighting in Syria, or commit acts of terror in Europe. In a video published by ShamToday on October 26, the media wing associated with the predominantly Chechen Islamic State (IS) faction Katibat Al-Aqsa, a Chechen militant named Musa Abu-Yusuf Shishani calls on the Chechen diaspora to join IS. Straight out the last issue of Dabiq, the Islamic State propaganda magazine.